Dream Pod 9: Final Week HGB Peace River & NuCoal Kickstarter Update! 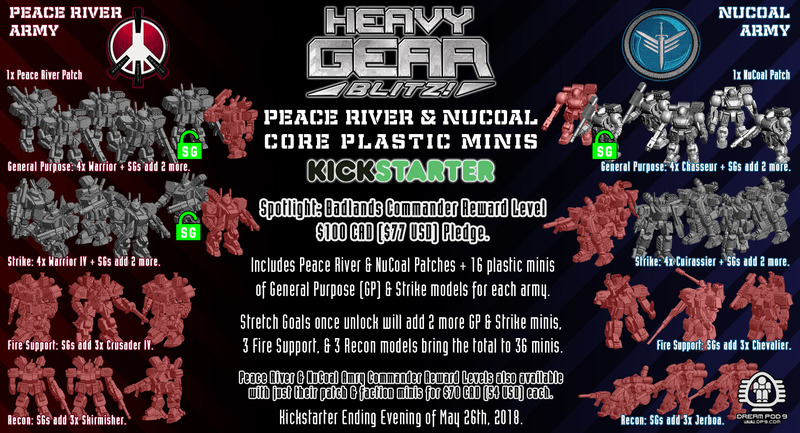 Its now the final week of the Heavy Gear Blitz Peace River & NuCoal Core Plastic Miniatures Kickstarter. After reaching our initial funding goal of $25,000.00 CAD, early in the campaign, to make a first plastic injection mold and give Backers some nice plastic miniatures for the game. Things slowed down a bit, but we have unlocked the first 3 stretch goals with over $33,611.00 CAD pledged. We have looked at whats reasonable to expect in the final week of the Kickstarter and updated our stretch goals and plans accordingly. The campaign page text, reward levels graphics, stretch goal graphic, some add-ons graphics, and pledge calculator excel sheet link have all been updated. The next major goal is Stretch Goal 09 at $50K CAD pledged for a second plastic injection mold that will include core Fire Support and Recon models for Peace River and NuCoal. Dream Pod 9 is committed to reaching this goal and unlocking the second mold and making the Backer Reward Packages some really amazing deals. If needed we will run an extra funding campaign after the Kickstarter ends using our pledge manager website to reach the $50K CAD goal. We have updated Stretch Goal 09 to give Backers an amazing reward. At $50K CAD pledged we`ll be adding 3 Crusader IV (FS support unit) and 3 Skirmisher (RC support unit) plastic miniatures to the Peace River Army Commander, Badlands Commander and their Hero of version Reward Level packages. Plus we`ll be adding 3 Chevalier (FS support unit) and 3 Jerboa (RC support unit) plastic miniatures to the NuCoal Army Commander, Badlands Commander and their Hero of version Reward Level packages. With this a Peace River or NuCoal Army Commander reward level will each include 18 plastic miniatures for $70 CAD pledged ($3.89 per mini). 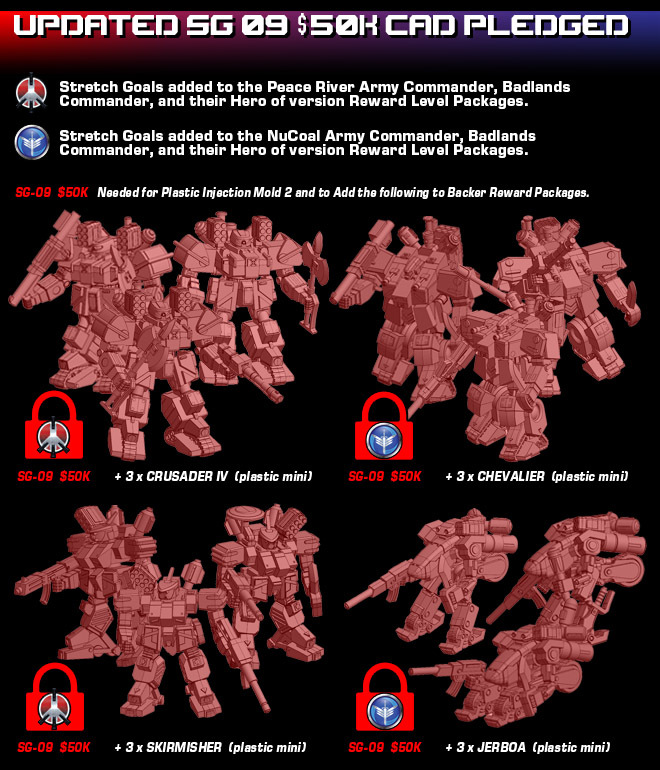 And the Badlands Commander reward level will include 36 plastic miniatures for $100 CAD pledged ($2.78 per mini). Plus we have made available all 4 of plastic miniatures as Add-Ons for an Extra Pledge right now for Backers that want to pickup extras, and make full Fire Support or Recon squads (combat groups) instead of support units for the GP and Strike squads. We had planned for a 3rd plastic injection mold at $75K CAD pledged that would have included the Peace River Argos, NuCoal Arbalestier, and Stoneheads badlands terrain as plastic miniatures. But for the Final Week we have pulled back on that plan and are now offering the Argos and Arbalestier as pewter miniatures in the Add-Ons for an Extra Pledge of $22 CAD each. Plus added our previously available resin terrain packs of Four Stoneheads in Sand ($22 CAD) and Four Stoneheads ($28 CAD) to the Add-Ons for an Extra Pledge for Backers that want to add some gaming terrain. Thank You to all our Backers for your amazing support so far, we`ll be working hard to get the word out to more potential Backers this final week. We think the updated reward packages at $50K CAD pledged are amazing deals and should help convince a few more to show their support and click the Kickstarter Link below. Home › Blogs › Robert Dubois's blog › Final Week HGB Peace River & NuCoal Kickstarter Update!